Wowowow. 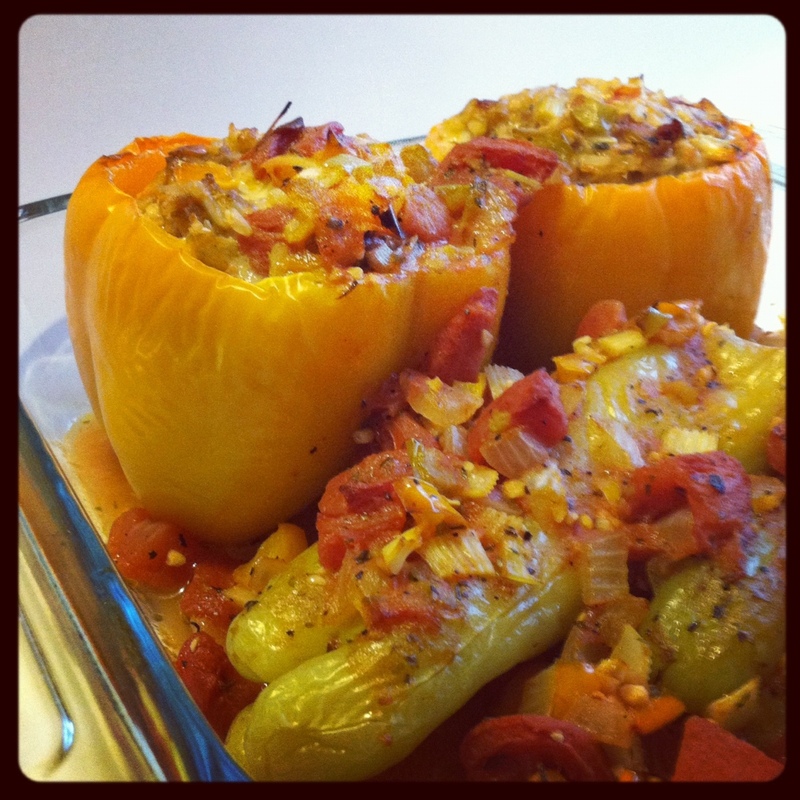 I made stuffed peppers today. Lots of work! They came out really tasty though. I was craving that after having the stuffed cabbage at Stamatis but that dish is very Greek with the creamy dill sauce and all so I wanted to make an Italian twist on it. Blanch the peppers first in salted boiling water for 5 minutes. Drain them and set them aside. Sauté onions, celery and pepper in a little butter and olive oil. Add minced garlic, dried oregano, salt, pepper and a can of diced tomatoes. Simmer for 10 minutes. Mix an egg with 1 pound of ground meat, salt, pepper and 1 cup of cooked long grain rice. Add 1 cup of the sautéed veggies to the mix and stuff into the peppers. Pour the rest of the veggies over the peppers in a 2 or 3 quart baking dish. Cook @ 350 for about 50 minutes. I used orange bell peppers and Italian peppers this time just because I wanted a little variation in taste. Also I used hot Italian sausage for the meat. All in all it was a really nice, satisfying meal! Makes nice leftovers too, I know I’ll be eating it for breakfast.